Creating an island paradise from an environmental hell is a big job. BBC Northern Ireland's rural affairs correspondent Martin Cassidy made the voyage to Ram's Island on Lough Neagh to see how it's being done. 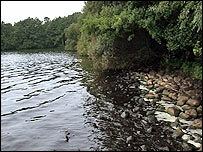 It is a short ferry ride out from the little harbour at Sandy Bay on the eastern shore of Lough Neagh to Ram's Island. No sooner have you cleared the harbour mouth and the long, tree-covered island comes into view. 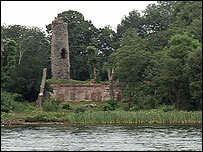 Ram's Island is about a mile offshore - and at one mile long by a quarter of a mile wide it is the largest island on Lough Neagh. A thin steel jetty guides the tour boats towards the heavily wooded shoreline. There is no beach, just a gap in the green canopy and from the jetty you step ashore into a clearing beneath the oak, lime and walnut trees. At once the island envelops the senses. Up above in the cool green canopy, forest birds like gold crest and finches call to each other. The atmosphere on the forest floor below is dank and still. The leafy carpet deadens the footsteps as we climb a gentle slope towards the centre of the island. And suddenly a round tower emerges in a clearing - the first evidence of earlier human existence here. One thousand years ago, Ram's Island was a monastic settlement and the tower is a relic of that chapter in its history. Brass fastening pins have been excavated nearby - thought to be from the monks' gowns. The tower itself is now just over 40ft high and is constructed from rounded stones - similar to those found along the shore. This is where the monks would have retreated when the island was under threat. But in a clearing near the tower are the remains of a much more recent island occupation. The brick walls of a summer house which Lord O'Neill constructed when he bought the island in the early 1800s remain intact. Overlooking the lough and set in what was an exotic garden, the house must have represented an island paradise. But Ram's Island has never been immune to decay or catastrophe. And just as the monastic settlement came to an end, so too the romantic summer house succumbed to vandals. During World War II the island was a favourite spot for visits by the American Eighth Army Air Force stationed at Langford Lodge. One night during the war, arsonists visited the island and burned down the cottage. It was the end of an era and it seems as if Ram's Island then retreated from the outside world. Over the coming decades the island would become overrun with vegetation, making its shores impenetrable. Gradually the summer house gave way to a jungle and even the exotic garden seemed to lose its magic. Plants brought in to enchant the island, turned against the place, smothering much of the natural vegetation and wildlife. Worse still was a plague of rats which feasted on the eggs laid by birds along the shore. From a paradise, Ram's Island seemed to be descending into an environmental hell. But then came salvation in the form of the Ram's Island Heritage project. With missionary zeal local volunteers set sail for the island armed with chainsaws and hatchets. Their aim was to reclaim the island from the invasive species which had overrun the place. Public enemy number one was a plant which had once graced the exotic garden. Its pink flowers may be attractive, but Himalayan Balsam had become a menace. For three years now the local volunteers have been steadily clearing the paths and glades, chopping back the balsam and sycamore trees. Next was the plague of rats. This was a job for experts and thanks to rural development funding, the island has now been cleared of theses predators. The result is that the birds have returned in numbers to breed along its shore. Up in the trees too, there are also magical things happening. Herons are nesting and this year produced a good crop of young birds which are now feeding on the lough's rich stock of fish and eels. Perhaps most magical of all is that as well as bird song, voices too are now rising up into the canopy above the paths and clearings. 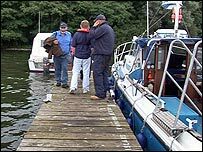 With financial support from a £3m Lough Neagh Regeneration programme, a new ferry service has been established and already more than 2,000 people have visited the island. But the restoration work still has a long way to go and there are long-term plans to restore the old summer house and its garden. Covering just over 40 acres, Ram's Island already offers a unique mix of natural woodland mixed with exotic species. An island which has seen both good and bad times, is again enjoying a renaissance.